If you are planning to launch your maiden website with support of web hosting provider, then you will have to interact with number of people from web hosting services. Since web hosting is driven by technology, there are chances that you may get bogged when faced with the technical jargon. It is always better to enhance your knowledge about common technical terms used in web hosting industry. This will not only improve your understanding but will also enable you to communicate with others with greater confidence. Additionally, you will be enjoying the process of choosing the right host armed with power of knowledge. Bandwidth- In simple terms, bandwidth is the capacity of data carrying of the physical or wireless network. It provides you information about channel’s data transfer speed. The rate of data transfer is associated with speed of communication. Bandwidth is one of the most important resources offered by webhost for delivering content of the website to its visitors. Cloud computing- It refers to the modern technology of storing and saving data at a centralized resource that is usually an assortment of multiple servers positioned at diverse locations. Cloud obviates use of a single computing source such as on-premise computer and provides access to the data from any location at any time. CDN- This is an acronym of Content Delivery Network that is used for delivering content across multiple global locations. It is designed to mitigate latency of data delivery by accelerating loading time of websites. CDN maintains cached data at various locations and facilitates delivery of data to visitor from the closest source instead of the main server location. Domain name- If you think of the internet as a vast expanse of land then a domain name can become your address. Visitors type domain name in the browser to access a particular website. Domain name helps computing systems or servers to understand what type of information is being requested by the visitor. It is generally represented as www.YourDomainName.com. Ecommerce- It is a shortened form of Electronic Commerce. Ecommerce involves use of internet as a medium for selling, buying, and marketing of services or products. Ecommerce facilitates establishing an online business through multiple categories of online services including online marketing, selling, billing and payment processing. It also covers online customer service and feedback. IaaS- Infrastructure as a Service is one of the cloud computing service models that involves a third party service provider that enables hosting of servers, hardware, network components, desktops, and other elements of computer infrastructure. 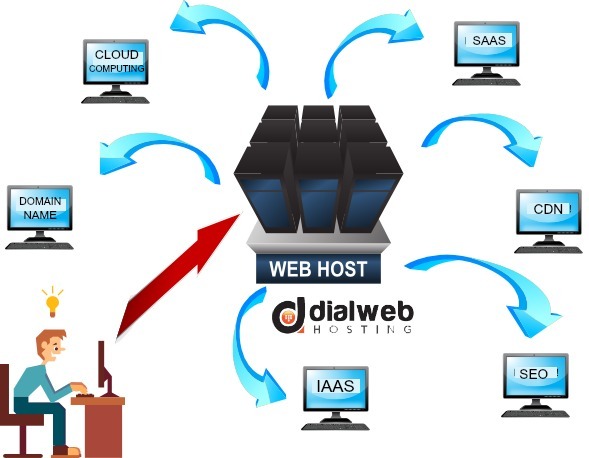 IaaS is delivered on the basis of outsourcing and is also sometimes referred to as Hardware as a Service. Online marketing- Proliferation of internet and extensive availability of internet enabled devices including smart phones have helped businesses reach out to customers via internet. Online marketing involves an assortment of tools and procedures for product promotion via internet. Wide range of channels and mechanisms available in computing technology and internet has broadened the range of marketing elements that are available in conventional method. SEO- It is an acronym for Search Engine Optimization that is used to improve visibility of website in search engine results. SEO consists of different methods to drive more traffic to website by promoting its search engine ranking. In order to achieve better search engine ranking, the website is optimized by improving quality of content, enriching it with use of relevant and strong keywords, meta-data, and cross linking. Server- Servers are nothing but computers that are used for sharing resources with other machines that usually operated by clients. Server is used for dedicated management of network resources. There are multiple types of servers such as cloud servers and virtual servers among others. Shared hosting- It involves a multitude of websites hosted together on a single server and are designed to share resources of that sever. SaaS- Software as a Service is one of the main cloud service models. It involves delivery of applications via internet that are hosted by vendor and accessed by users on pay as use basis. SSL- Secured Socket Layer or SSL relates to the security protocol for establishing a secured internet connection between server and client. SSL has become an essential part of online transactions due to involvement of sensitive data such as credit card details and other personal information of clients. TLD- It is short form of Top Level Domain and can be seen as the last letters that are preceded by dot. Hence in google.com, ‘.com’ is the Top Level Domain. Traffic- It is volume of data that is travelling across a network or to the website. Uptime- It is a measurement of operational efficiency of device or an IT system. It usually represented in percentage of time. In webhosting an uptime of 99.99 percent is considered as the acceptable level for mission critical applications. Web hosting- It is a service provided to website owners for keeping their sites up and running by facilitating space on servers and supporting with basic infrastructure facilities of data center on rental basis.